In the first weeks of the war commentators begged the Government to make their war aims clear to the public – what was the country fighting for? Surely this was a vital step if the Government was to succeed in getting men to volunteer. When the war was over, headstone inscriptions revealed the myriad causes for which the men and their families believed they had been fighting. Some of which were the same as the Government’s. The Unknown Warrior’s headstone was in place before many of the war cemeteries were constructed so it is very likely that the words influenced the public when the time came for them to make their own choices. 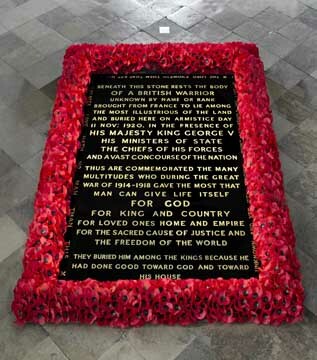 And the Warrior’s headstone gave a fair number of causes to choose from: God, King, country, loved ones, home, Empire, justice and the ‘freedom of the world’. Nevertheless relatives could still find more: from the abstract concepts of world peace, honour, democracy and civilization to the very specific, ‘for his wife and little son’. You will find some of the many different reasons in the associated posts. 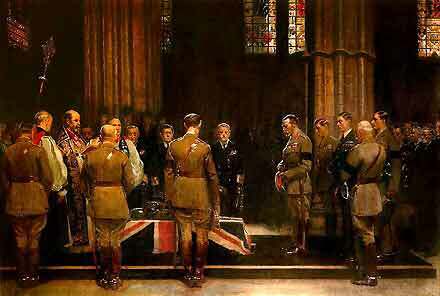 King George V with the ‘Chiefs of his forces’.